This painting represents a very different approach for me. It's something I've wanted to do for a long time but it's not always possible to get close enough to a subject. 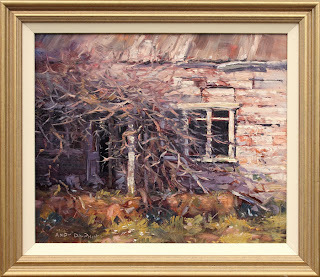 It is inspired by the likes of Richard Schmid, whose work I discovered in an issue of International Artist Magazine around 12 years ago, Harley Brown, whose book "Eternal Truths" provided guidance to me almost ten years ago, and Tibor Nagy, whose work I discovered online just a few years ago. I've long-admired their combined loose-tight style, where focused impressionism sits atop an abstract foundation. It's something I've been drifting toward for the last couple of years, especially with my plein air works. 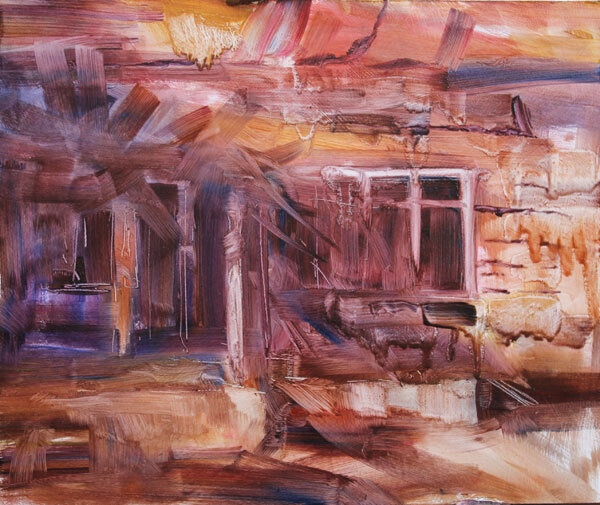 This abandoned and somewhat derelict cottage provided a perfect opportunity for me to develop my style further. As you can probably see, it is all about the hard shadow cast across the wall of the house. Here's the under-painting. 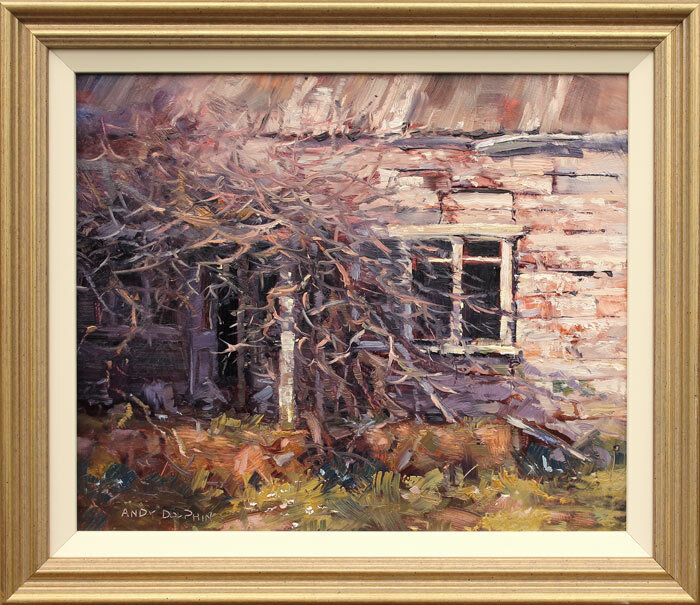 The finished piece was mostly going to be cool greys but the cottage had a sort of organic, rustic charm, so I wanted a warm, earthy feeling to flow through. I was soon challenged by the sun disappearing behind clouds,before I'd locked enough of the painting in place. In fact, it rained on me half-way through. When the clouds roll in and the sunlit areas of the subject are cast into shadow, the details that used to be hidden away in dark shadow areas suddenly reveal themselves. It's easy to start fidgeting when this happens and unnecessary detail can creep into the painting. And indeed, that's exactly what happened (you'd think I'd learn by now to just walk away or something, but no). 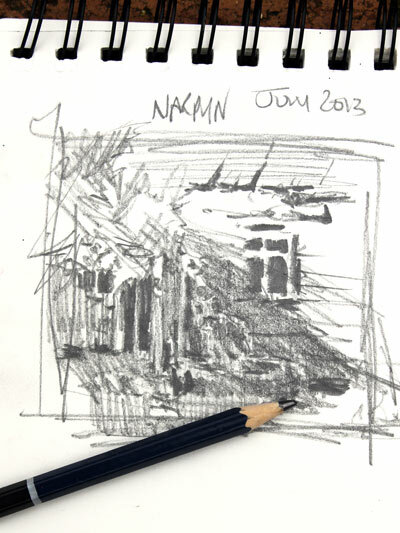 My original intent was to create a very loose, high contrast sketch with detail only around the focal point, the window. But I played with it while I waited for the sunlight to return and it tightened up more than I'd planned and I lost almost all the contrast. One of the major pieces of information I lost without the sunlight was just how the leafless, woody creeper was supposed to look. My thumbnail shows that it was probably very striking, and mostly brightly lit, but I no longer had any reference and, without the sun shining, it was just a drab collection of twisted grey sticks. I had to invent light and shadow for it. I regard this one as little more than an exercise – not good enough to sell but not bad enough to scrape. I will go back and try this same painting again when the weather is more stable. I might even throw this one back up on the easel and see what lessons I can drag out of it by making changes.